Last year I started putting a little “from the archives” section at the end of all my blog posts to show what I posted on the same day for the past 5 years. It was a fun way to go back and look (and sometimes cringe) at older posts. One thing stood out for me as I perused my archives: my favorite year to look back on was 2012. That year, I had a lot of fun experimenting with different color combinations and exploring new places to take photos. Since then, I’ve tried to step up my blogging game in many ways, but that exercise of looking back reminds me that I don’t want to lose myself at the expense of “improvement.” Sure, I want to create relatable, share-able content, but I also want to be the girl who isn’t afraid to mix bright colors or take a few style risks. 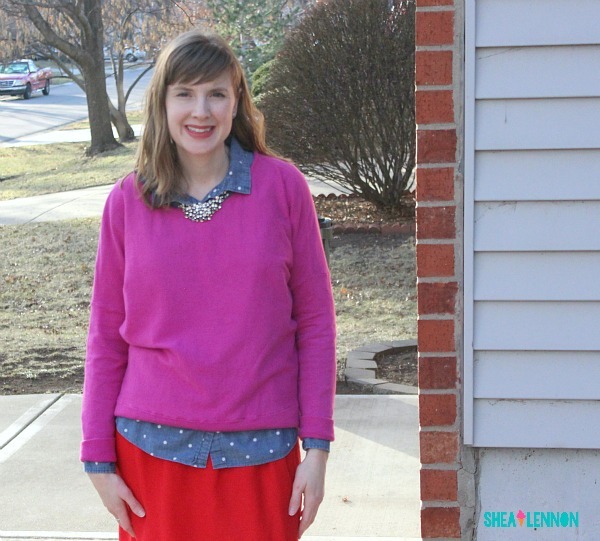 With that in mind, and with Valentine’s Day coming up this month, I thought I’d do a post on one of my favorite bold color combinations, red and pink. 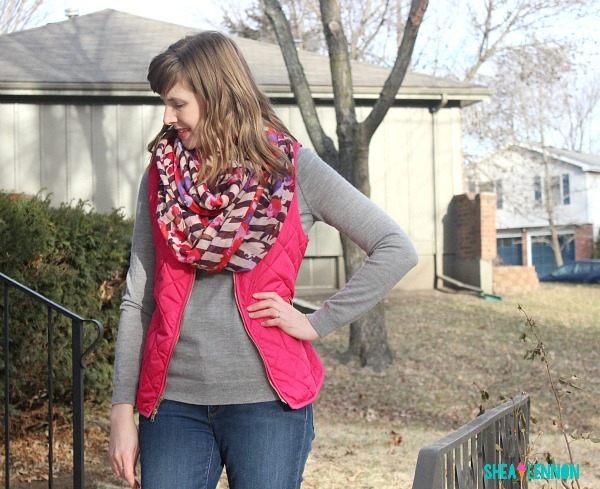 I realize that wearing a hot pink quilted vest and describing this look as subtle may seem a bit contradictory, but relatively speaking, I think it is. This outfit’s base is neutral: a gray sweater and jeans. 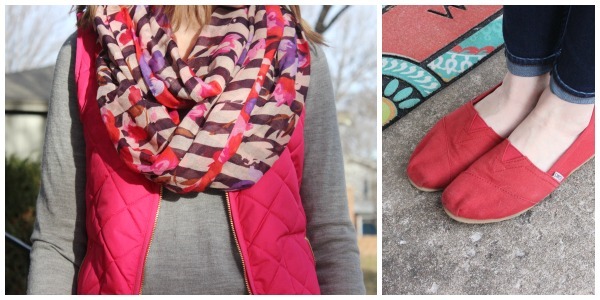 I added the pink vest, red shoes, and a scarf to tie it all together. 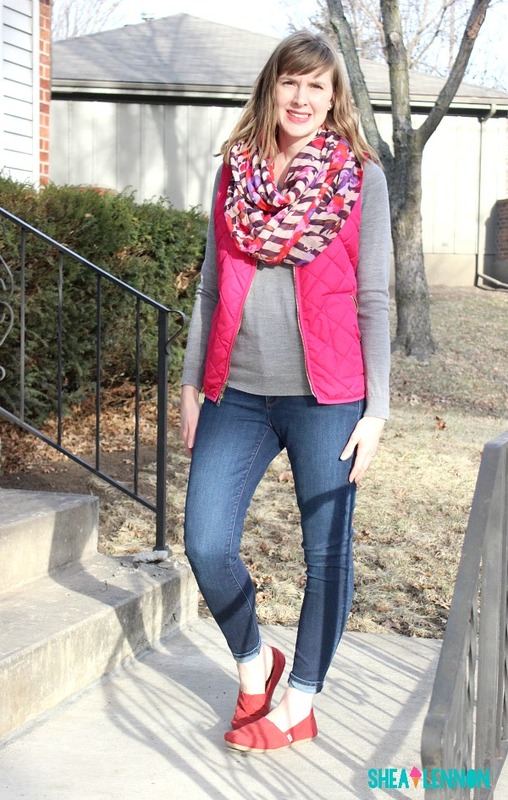 For an even more subtle look you could skip the vest and instead just incorporate shades of red and pink with your scarf and shoes. 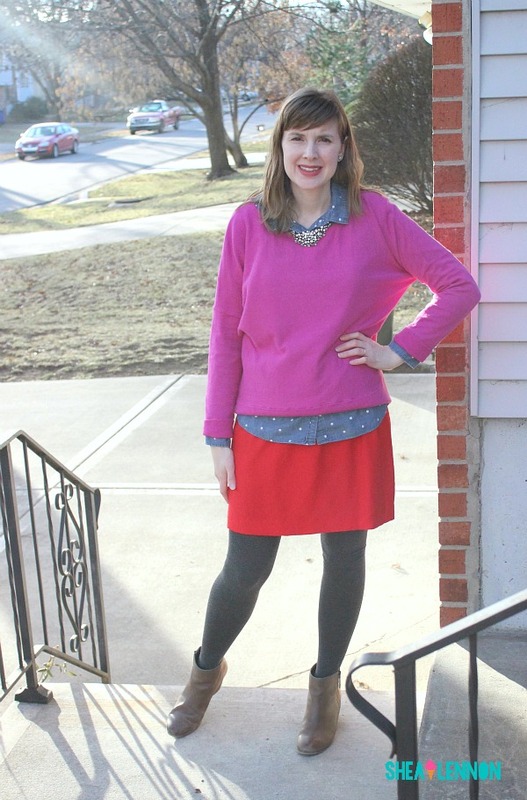 This look is obviously not for the color shy. 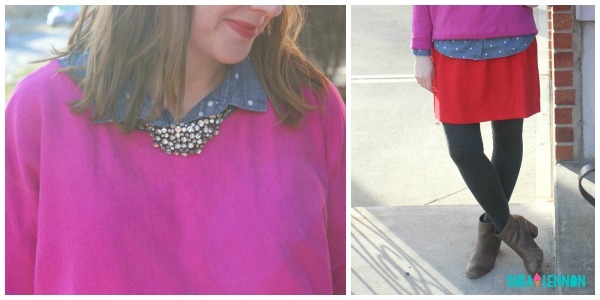 I think the chambray shirt layered under the sweater helps break up the bright colors, but it is still a bold combination. It feels straight out of 2012, but in the best way. Do you ever wear red and pink together? How do you combine the two? Linking with Mix it Mondays, Hello Monday, Let it Shine, A LovelyLittle a la Mode, On Trend Tuesdays, Confident Twosday, Oh Hey Girl, and Thursday Fashion Files.